Pet owners who buried their animals in a pristine country setting in Orange County, New York, are distraught with worry after learning the cemetery land was sold in auction. Sarah Wallace reports. 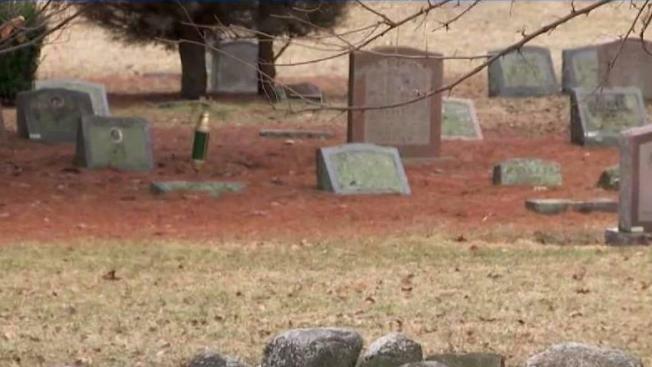 Pet owners who buried their animals in a pristine country setting in Orange County, New York, are distraught with worry after learning the cemetery land was sold in auction. The Abbingdon Hill Cemetery in Crawford houses hundreds of graves, including one owned by Barbara Walters for her beloved poodle Sale Gosse. Now the phone is disconnected, the office closed, and the property sold in a tax auction. Jim Davies and his partner have nine pets buried there. They picked the 15.5-half acre cemetery for its serenity and beauty when they lived in the Hudson Valley. They paid up front for perpetual care for their pets, buying a large plot. “Like when anybody dies, you just want them to rest in peace. Now, we’re sick with worry,” said Davies, who now lives on Long Island with his partner. The two have been unable to reach the longtime cemetery caretaker. The I-Team obtained records that showed the property was sold in a tax sale for $120,000 in April, 2017. Within a two-day period, a New York businessman, Ahmad Reyaz, bought up nearly two dozen parcels in Orange County for $713,000. The property’s pet cemetery license lapsed in November of 2017 and was not renewed. “I worry that he’ll come in here with a bulldozer and just bulldoze this place down,” said Davies. Ronni Korder, who lives in Searington, Long Island, has seven pets buried in the cemetery and is equally frustrated. “My biggest fear is that my animals will be gone and I won’t know what happened to them,” she said. Some of the owners paid for perpetual care, while others paid ongoing maintenance fees. The I-Team reviewed receipts from owners that showed fees were collected by cemetery management even after the burial ground was no longer licensed. Reyaz, who owns a heating and cooling company in Mount Vernon, declined to speak to the I-Team on camera about his plans for the property. “It’s not in my interest to talk to you about that,” he said. He added he did not know the property was zoned as a pet cemetery until after he purchased the land. New York State has a pet cemetery law that says the use cannot be altered unless pet owners give written consent and by an order from the local court. The new purchaser would be obligated to pay any reburial costs. The local zoning board said there has been no application or inquiry about any proposed development. That information is of little comfort to pet owners interviewed by the I-Team. “The whole thing is upsetting beyond belief,” said Korder.